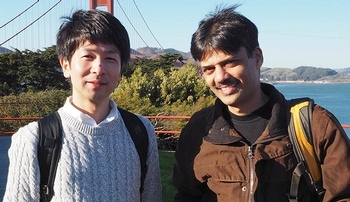 From left, Masato Ohtsuka, Ph.D., and UNMC's Channabasavaiah Gurumurthy, M.V.S.C., (D.V.M. ), Ph.D.
UNMC Munroe-Meyer Institute researcher Channabasavaiah Gurumurthy, M.V.S.C., (D.V.M. ), Ph.D., who last year announced a new tool that genetically alters mice for specific scientific studies, can now alter those genes directly into a fertilized egg in that mouse. The groundbreaking work was done in collaboration with Masato Ohtsuka, Ph.D., an associate professor at Tokai University in Japan and is published in the March issue of "Genome Biology." The Easi (Efficient additions with ssDNA inserts)-CRISPR technology, when paired with the new discovery called Genome editing via Oviductal Nucleic Acids Delivery (GONAD) can make those genetic changes without the need for complex microinjections. The GONAD technology makes it easier to insert new sequences at the genomic cut sites, to correct disease mutation or replace a faulty gene, he said. The method generates mouse models containing single-base changes, kilobase-sized deletions and knock-ins. The efficiency of GONAD is comparable to that of traditional microinjection methods, but avoids the technically difficult steps of handling zygotes in ex vivo fashion, which requires a separate recipient animal for embryo transfer. "Such features make GONAD a perfect tool suitable for gene therapy applications," Dr. Gurumurthy said. Findings for Easi-CRISPR were published last year in "Genome Biology" and "Nature Protocols," and it was named "Best of 2017: Top Pick Genome Biology." Drs. Gurumurthy and Masato said that both the Easi-CRISPR and GONAD methods already are being used in numerous labs worldwide thanks to the BioRxiv server where preprints of the articles (biorxiv1, biorxiv2 and biorxiv3) were published several months before their publications in peer-reviewed journals.